Scrambling covers the ground between walking and climbing, its a brilliant way to work your way to a summit and gives great situations with some exposure usually. We offer this activity as an option for younger groups who want to take in a small summit as part of one of our Multi Activity Day options in the Lake District. Our qualified instructors will be at hand to safely guide your group throughout. We also offer the full range of technical scrambling instruction and guiding, see Mountaineering and Scrambling for this. We generally run our group activities in the Lake District, a brilliant venue for all outdoor activities and where a scramble can be combined with another activity and with short scrambles suitable for younger groups, but Scotland also has many great long scrambles we regularly use with more scrambling focused groups. We can easily offer the service elsewhere though, North Wales offering great scrambling terrain for example. If your looking for technical scrambling courses then follow the links below. We are very flexible and mobile with this service and can advise on the best place to run a residential programme from and choose the best venues for your selected activities. 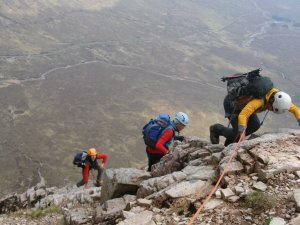 Note – for technical scrambling instruction and guiding see Mountaineering & Climbing – Scheduled Courses and Trips for courses with set dates, and for bespoke days out see Mountaineering & Climbing – Private Guiding and Instruction.